Doha, Qatar, October 3, 2018: In continuation to its vision of expanding scope of Qatari companies across the globe, Qatar Development Bank’s Export Development and Promotion Department ‘TASDEER’, hosted in recent months several trade missions as well as participated in a number of exhibitions in lucrative parts of the globe. Through its activities, TASDEER aims to promote exports from Qatar and enhance the expanse of Qatari SMEs at global platforms. With an aim to support Qatar National Vision 2030 and enhance the growth potential of Qatari SMEs, Qatar Development Bank (QDB) took part in Columbia Plast, which was held from September 24—28, 2018 at Centro de convenciones, Bogota, Colombia. With around 705 exhibitors and 37,772 visitors, the event immensely offered one of the best platforms to companies operating in the plastics and allied industries. Qatari SMEs are known for their manufacturing finesse and this platform aptly highlights their immense potential. As part of the special pavilion hosted by QDB, participating companies included Doha Plastic, Al Naqeeb Plastic Factory, Qatar Rubber, Bin Aman Plastic Industries, Hepworth PME, Al Haya Plastic, TWYLA Recycling, Al Rayyan Plastic Factory, Al Muftah Polymer, Al Muftah Fiber Glass, Al-Sada Factory for Plastic Pipes, Al Sada Profile Factory, Qatar Polymer Industries, Gwalls, and SarplastQatar. Columbia Plast, since its first version, has managed to strengthen the commercial relations of the sectors of plastic, rubber, petrochemical and packaging at national and international level. Thanks to the recognition as the best fair exhibition within the framework of the International Fair of Bogotá - Industrial Exhibition, it has managed to attract a large number of exhibitors and visitors both from Colombia and from different countries of the world. Furthermore, as part of its SMEs’ growth drive, TASDEER participated in World Food Moscow exhibition, from September 17-20, 2018, held at Expocentre, Moscow, Russia. The World Food Moscow event is the main platform in Russia where food trade professionals, international associations, government ministers and international press can assess the market; network with existing and new clients, as well as conduct and conclude deals for the future. World Food Moscow annually gathers international food and drink companies from over 62 countries. As part of the special pavilion hosted by QDB, these SMEs represented Qatar’s economic potential: Qatar Meat Production Co. Agrico, Gulf Water Plant, Kaafe Chocolatier, IN-Q Factory & Co, Albina Snacks, Asak Group, Azbah Farm &Munah Foods Factory, Al Qaseem Dates &Raha Bakers, Al Sulaiteen Agricultural & Industrial Complex (SAIC), United Mineral Water, Colosseum Doha, and Gulf Food Production. In yet another initiative to further expand the Qatari SMEs’ expanse, TASDEER participated in the 12th edition of Medical Fair Asia Singapore, held between August 29-31, 2018 at Marina Bay Sands, Singapore. 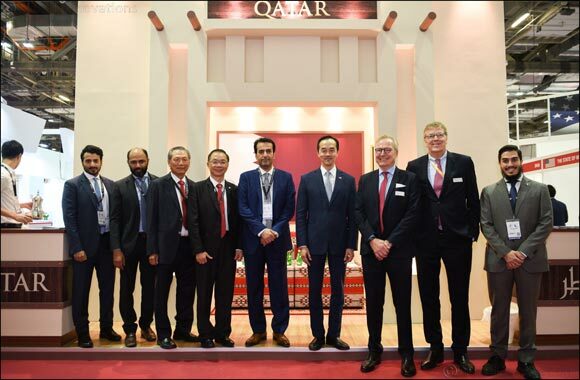 QDB had set up a special pavilion to give exposure to SMEs at such global events and eventually help them promote their products in the international markets. List of participating companies as part of special pavilion included Qatari German Medical Devices, Qatar Life Pharma, Shoura Business Group, Fine Posture, and Qatar Pharma. The last edition event, which saw a 30% increase in floor space than the previous edition, was entirely filled by 830 international companies from 40 countries. Visitor numbers also increased, attracting an attendance of 12,100, with 40% coming from overseas. International visitors came mainly from all over Southeast Asia along with India, Japan, South Korea, China, Hong Kong, Taiwan and Australia. During the months of July and August, TASDEER hosted successful trade missions to Australia and Ethiopia. The selection of these two nations by TASDEER lies in the fact that both the countries share a great trade relationship with the State of Qatar. The volume of trade exchange between Qatar and Australia reached nearly QR2.97bn in 2017. Similarly, Ethiopia’s import from Qatar stood at QAR 31 Million in 2016, while Ethiopia’s export to Qatar stood at QAR 7.3 Million. Through its research-driven export initiatives, TASDEER regularly aims to assist all local enterprises, particularly those with the ability to export, to break into regional and international markets. Since the establishment of TASDEER, the exports development program has successfully introduced Qatari exports to various world markets and reinforced the QDB’s support to local business through the provision of credit guarantees, services on trade finance, and risk hedging on invoices. The scope and breadth of TASDEER was recently recognized on the international stage when International Trade Center (ITC), a joint agency of the World Trade Organization (WTO) and the United Nations Conference on Trade and Development (UNCTAD), nominated QDB for the 2016 Trade Promotion Organization (TPO) Award, under the category of the best development agency in a developing country. Incidentally, QDB was the sole development agency shortlisted from amongst the countries in the Gulf Cooperation Council (GCC) and Middle East and North Africa (MENA) region.